Learn the Reactivity of Ionic Compounds. 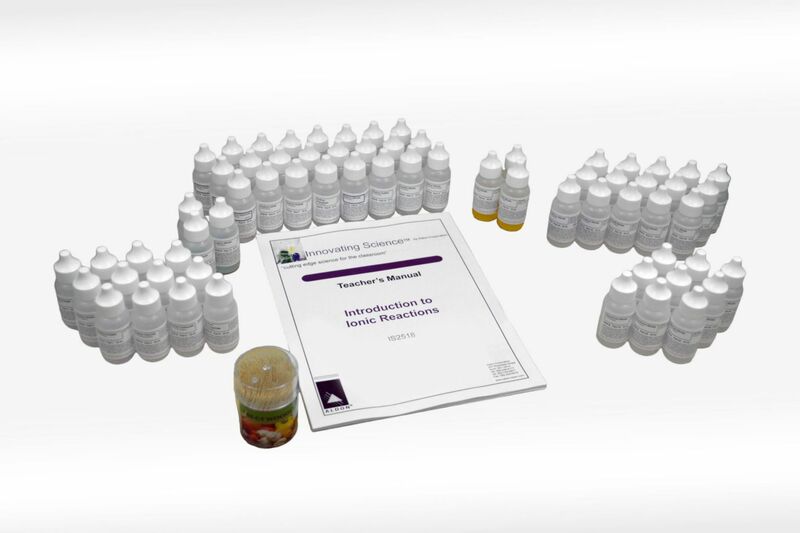 The activity in this kit is designed to introduce students to the concepts of ionic reactions. Students will test a series of microscale chemical combinations watching for reactions. The contents of this kit have been optimized to minimize risks of cross contamination, teacher preparation and waste generation. Ordering information: Kit includes Sodium Acetate Solution, Sodium Chloride Solution, Sodium Carbonate Solution, Sodium Ferrocyaide Solution, Sodium Hydroxide Solution, Sodium Iodide Solution, Sodium Oxalate Solution, Sodium Phosphate Solution, Sodium Silicate Solution, Sodium Sulfate Solution, Lead Nitrate Solution, Silver Nitrate Solution, Copper Nitrate Solution, Cadmium Nitrate Solution, Strontium Nitrate Solution, Cobalt Nitrate Solution, Zinc Nitrate Solution, Aluminum Nitrate Solution, Chromium Nitrate Solution, Iron Nitrate Solution, Barium Nitrate Solution, Toothpicks, Acetate Sheets, and Teacher's Guide and Student Copymaster.